The Evening Sanctuary has opened for a third night on Fridays from 6pm-2am and will be open over Christmas and New Year. Meanwhile, the first 24-hour mental health support line was launched on December 18 by the South London and Maudsley NHS Trust (SLaM). The new helpline will work collaboratively with PALS (Patient Advice and Liaison Service) and Solidarity in a Crisis peer support project, across Lambeth, Southwark, Lewisham and Croydon. The line is for service users, carers and anyone who needs advice, help and assistance while in crisis or facing difficulties dealing with mental illness and brings a more coordinated response and easier access to support. Martin Baggaley, medical director at SLaM, said: “This is a really significant step forward in helping people who are going through a mental health crisis and is the first 24/7 telephone service for the trust. “Calls will be answered by a nurse and we will then explore with callers the reasons why they have contacted us and identify what can help at that time and for the future. This is the same number that takes patients through to PALS. The support service was developed in line with the Crisis Concordat and is part of all borough action plans and is jointly funded by the four borough’s clinical commissioning groups (CCGs). 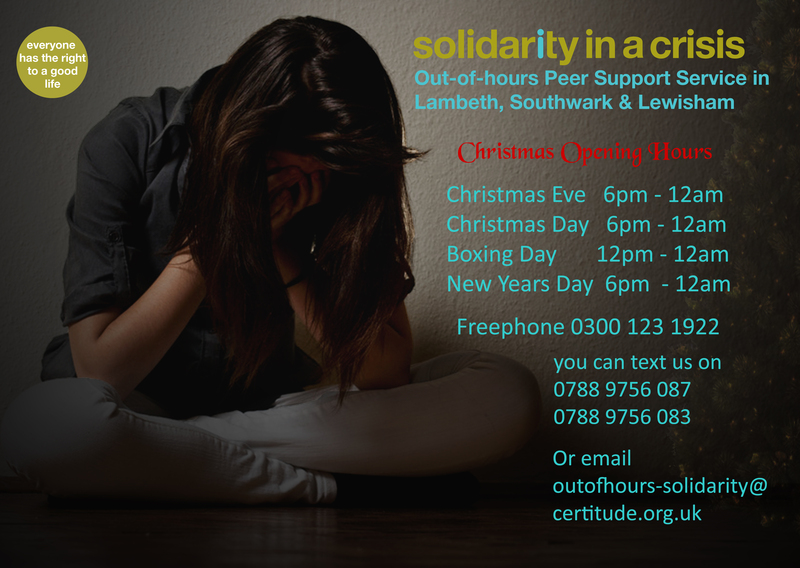 Solidarity in a Crisis will also offer a service over the Christmas period for those who want to speak directly to a peer supporter. 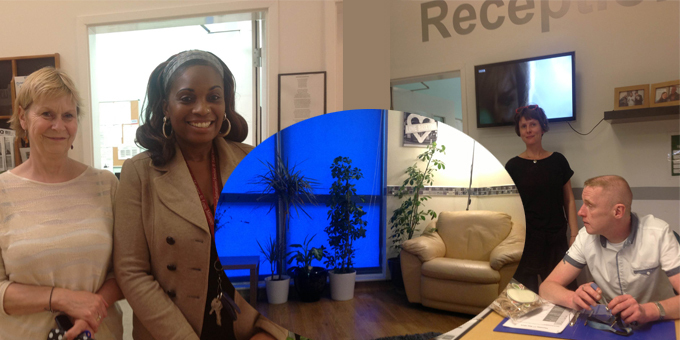 The Sanctuary, based at the Living Well Partnership (LWP) Brixton, opened in May (Wednesday and Thursdays, 6pm-2am) offering an alternative to those presenting in crisis at A&E at Kings and Guys& St Thomas’ hospitals. Until now, people have been referred by the hospitals’ Psychiatric Liaison teams. Once referred they can be picked up or make their own way to the Effra Road base and go home by taxi if they wish. The Sanctuary is staffed by two senior support workers and member volunteers (Mosaic) and peer supporters from Solidarity in a Crisis. The Sanctuary grew out of the Lambeth Living Well Collaborative’s crisis house work and is a good example of co-design coming to fruition involving service users, peer supporters, carers, the voluntary sector and statutory services. The Sanctuary will be open at different hours over the festive season – 5 – 10pm on Christmas Eve and will provide a service during the day from 10am-6pm. On New Year’s Eve, it will open 5 – 10pm and on New Year’s Day, 11am – 3pm. See below. Maresa Ness, Chief Executive of Mosaic Clubhouse, (LWP hosts) is keen to drive the project forward and is trialling the expansion of referrals to more teams plus Mosaic Clubhouse members. This may include community mental health teams and those in touch with Solidarity in a Crisis, but it must have been agreed during the day so that there is the relevant information to support people. “We can’t take anyone without a risk assessment, which is usual practice, but people can present to the information service during the day so that we can get to know them,” she states. Pictured above, left to right: Maresa, Beverley (Programme Manager), Freddy and Damien, Senior Support Worker at Evening Sanctuary. As well as the new support line, SLaM has reviewed the street triage telephone service that was piloted for one year and will be opening up the line 24 hours a day. This enables a front line professional to ring the team 24/7 on 0203 228 0136 when in contact either in the street or in private premises with people whom they believe may be in mental distress. The overall aim of the team is to work collaboratively including directly with the person to gain the best possible outcome from their contact with emergency services.